When it comes to selling used and refurbished Stoves we offer a wide variety of used Stoves for rental homes, new home purchases, upgrade of existing appliances. 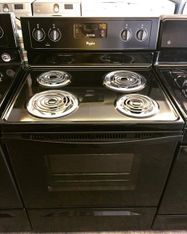 We take pride in the used Stoves we sell in the greater Houston area in a variety of brands, ages, colors, and sizes. Feel free to come to our showroom in the West side of Houston and take a look at our appliances with name brands such as Whirlpool, Kenmore, Maytag, GE, Frigidaire, LG, Samsung and other major brands. blemishes and are in excellent shape. Today's ranges, ovens and cook-tops are innovative, multitasking appliances able to cook more dishes at once, saving time and energy. The right stove adds a good measure of convenience to your kitchen, and improves any recipe, making mealtime more enjoyable. Measure your existing appliance or the space you need to fill. Determine whether you need electric or gas connections. Look for installation instructions on the range, cook-top or wall oven you are interested in for exact cutout specifications to ensure a perfect fit. Today's appliances have features to help you do more. Look for ranges and cooktops with high heat or low power burners for a customized cooking experience. If you feel the need for speed, keep in mind that convection ovens cook 25-30% faster. 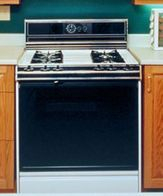 Ranges are appliances that combine an oven and a cook-top into a single piece. Ranges can be freestanding, slide in or drop-in. Freestanding ranges have finished sides and either a rear or front control console. These units can go between cabinets or stand alone. Slide-in ranges have a seamless look with controls on the front. If the slide-in range replaces a freestanding unit it will come with a back-splash or filler strip for a more streamlined appearance. Slide-in ranges come with your choice of finished or unfinished range cabinetry. Finished cabinets may be used in any application, while non-finished models require cabinetry on both sides for proper installation. Drop-in ranges look similar to slide-ins, with controls on the front, but may require cabinet modification for a tight fit. You can tell the difference by the strip of cabinetry under their ovens. Wall ovens offer the same characteristics as ranges without the floor footprint because it is installed in the cabinets. Because these ovens are installed at work level, they reduce back strain from bending and lifting. Cook-tops are installed in the counter-top and use either gas or electric heat, just like ranges and ovens. The number and configuration of the burners range from 4-8, with optional special burners for simmering and boiling, to suit your personal cooking preferences. Induction cook-tops are available and heat 25-50% faster than traditional electric, offering responsiveness close to gas without the flame. Capacity refers to the oven’s inner cooking space and is measured in cubic feet. 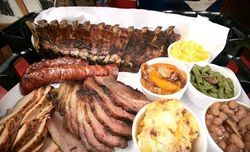 The size of your oven depends on how much cooking and entertaining you like to do, as well as the number of items you bake or roast simultaneously. The ovens on all ranges come with multiple oven racks to accommodate more than one dish at once. Consider simultaneous range hood replacement for an updated and streamlined appearance. Modern cook-tops and ovens are easy to clean and maintain. Smooth surfaces and covered interior burners wipe down easily. Also keep an eye out for cook-tops with raised edges help to contain spills and protect your counters and floor. Self-cleaning settings work by heating the oven to very high temperatures to reduce interior residue to a small pile of ash that is easily wiped out of the oven. Some ovens use a Steam Assist cleaning feature that uses a small amount of water and a low temperature to loosen interior residue for easy removal.